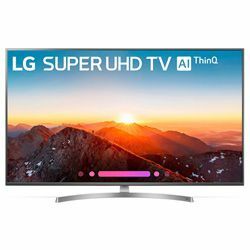 LG 65SK8000PUA is a Smart LED TV presented in 2018. 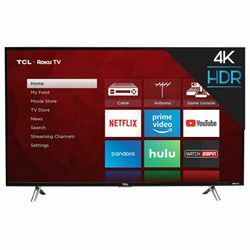 TCL 65S405 TV is a 2017 model. The units have the same 65-inch screen size. When testing TCL 65S405 vs LG 65SK8000PUA specs, I found out they differ much in audio features: LG 65SK8000PUA has built-in DTS decoder and Dolby Atmos technology that ensure deeper sound. I can’t say TCL 65S405 sounds bad, but when I compare it with LG 65SK8000PUA I can notice that the sound is purer and more impressive. LG 65SK8000PUA guarantees a really cinematic impression. Its α7 Intelligent Processor powers 4K HDR video files, letting enjoy deep, sharp, and crisp colors. The TV’s local dimming brightens and dims automatically, intensifying the contrast and producing deeper black for a richer picture. 4K Cinema HDR with AI ThinQ technology supports main High Dynamic Range formats, like Dolby Vision, HDR10 with HLG. It creates the picture of UltraHD quality and ensures an expanded range of colors. TCL 65S405 is also capable of delivering the contrast, color, and accuracy of HDR for a premium image. Direct-lit LED with 4K Ultra HD clarity produces a stunning picture. TCL UHD TV allows watching action scenes with fast movements without any motion blur thanks to its 120Hz refresh rate. It has a wide color gamut that makes the images look real. LG 65SK8000PUA offers Wi-Fi and Bluetooth support that secures access to your favorite media-service providers, like Netflix, Hulu, HBO, etc. Both remote and voice control are available. Intelligent Voice control allows monitoring the settings. Browsing and adding new channels are also possible with voice. TCL 65S405 doesn’t support Bluetooth but it’s MHL-compatible that smoothes this disadvantage. The 65S405 lets access Roku TV, which features thousands of streaming channels with movies and TV episodes. The TV comes with user-friendly remote control. There are just 20 buttons that facilitate navigating. LG UHD Smart TV has a slim, elegant metal frame with a distinguished brushed texture. Its stylish gray will enhance any space. TCL 65S405 TV is presented in black with 4 silver legs that also allows it to fit any interior. All connectors are located on the back panel, in both models. LG 65SK8000PUA has bigger depth with stand, 12.5 inches versus 9.7 inches in the TCL TV. This feature should be considered when installing. Nano Cell Display ensures a wide color gamut for delivering lifelike colors. It is also capable of removing undesirable light and reducing reflectivity to achieve deeper black levels.